How Much Time Away from Work Do the French Enjoy? Before you begin working your way to foreign language fluency, it helps to understand the culture behind the language you’re learning. After all, language exists to help a group of people express their ideas and beliefs. France is an old country with a rich history and culture. As you begin your French language program, gaining a strong grasp on this history, the values, and the etiquette will help you rapidly achieve success. In particular, the French understand the importance of work but prefer to maintain a proper work-life balance, regularly taking and cherishing vacation time. Even though French executives are typically quite business-minded, they place a significant amount of importance on building strong business relationships. Rather than simply discussing contracts and statistics, they often see considerable value in engaging with you on intellectual topics, which may span a variety of fields, from theology to history and politics. It is their way of discovering what type of individual you are, as well as the extent of your intellectual and educational abilities when conversing on a variety of topics. When dealing with French professionals, always remember your discussion topics and skills that you learned when you attended university. In some instances, relationship building may span the course of several meetings before you actually begin discussing business. If this happens, you must force yourself to be patient so that the door is not closed to future opportunities. The French business model is also very hierarchical. This means that when attempting to do business with a French executive, you must make sure you are dealing with the decision-maker. Make sure the individual with whom you plan to discuss the business deal is your direct counterpart in the French corporation. Similarly, do not plan to discuss details of a technical nature with managers who ranked lower than the decision-maker. Have another person at your own company complete such tasks. Executives in France clearly prefer to be given time to make decisions instead of feeling rushed. Therefore, taking the time to create a strong working relationship with your French counterpart is vitally important. Even within France, banking hours vary based on the location of the bank. For instance, the banks in Paris operate strictly from 10:00 a.m. to 5:00 p.m. Monday through Friday. Other banks throughout France keep more typical business hours, opening at 10:00 a.m. and closing for the lunch break at 1:00 p.m. Those banks then reopen from 3:00 to 5:00 p.m. Country banks operate on a typical Monday through Saturday schedule. It should be noted that banks in Paris and throughout the country may close early on the day preceding a holiday or major festival. Foreign exchange stations and ATM machines located throughout each city make banking business a little more accessible, particularly for businesses. Both types of automated machines can be found near the banks themselves, as well as at major shopping centers and popular tourist stops. Banks are more secure in France. While all banks throughout the western world maintain some type of electronic surveillance and live security offers, French banks offer an added security feature. Most banks employ a system of double doors that ensure only one individual can enter the bank at a time. To gain entry, press the red button on the first door and wait for the light to turn green. Once inside, wait for the first door to close behind you and repeat the same procedure with the second door. This is helpful in ensuring armed robbers or terrorists cannot rush the bank in a large group. The French people are hardworking and dedicated to whatever craft they serve, but that’s not to say they don’t know how to unwind. In fact, recreation and relaxation is just as vital to the French lifestyle as ambition and productivity. France has 11 national holidays. In addition to those that are common worldwide, such as Easter Sunday and Christmas, France celebrates Victory in Europe Day on May 8, Bastille Day on July 14, and Remembrance Day on November 11. The Assumption of the Virgin Mary is celebrated on August 15 and All Saints’ Day is marked with observation on November 1. France also takes national holidays for several holy days throughout the year. For instance, Ascension is celebrated early in the month of May, 40 days after Easter Sunday. Later that same month, the French receive holiday time to celebrate Pentecost, which is also known as Whitsun or Whit Sunday. In France, holidays that fall on a Tuesday or Thursday are cause for special celebration. The French will employ a concept known as making the bridge, or “faire le pont,” and institute a long weekend away from business. Overall, French workers are on the job for 35 hours per week. Technically, they are scheduled more than those 35 hours, but the country has more national holidays than either the United Kingdom or the US. Additionally, French workers get more vacation time per year than British or American workers. They generally get five weeks each year of paid time off. On the other hand, they are one of the most productive people in the world. There’s no denying that the French work hard during those weekdays. In effect, they earn their off hours, so the weekends are spent living life to the fullest. During their free time, the French mostly spend time with friends, hanging out, talking, and relaxing. Time is also spent with family, reconnecting and indulging in the benefits of deep communication. 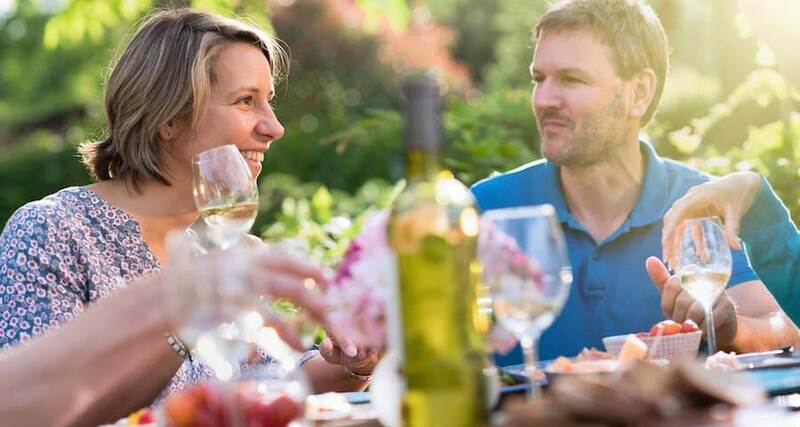 The French love conversation and take time to appreciate it, while doing hobbies like gardening and woodworking, or during meals and special outings. Shopping is another indulgence the French pursue during their off hours and, for them, the experience is as rewarding as the items they buy. From supermarkets and hypermarkets to specialty stores and fresh produce stands, business is booming with increasing numbers of French consumers. One particularly favored industry is the bakery. Baked goods are so sought after in France that most bakeries operate business hours well into the evening. Open by 7:30 a.m., the “boulangerie” (bakery) offers a wide selection of fresh breads and baked goods, including the ever popular baguette, or French loaf. Of course, there are other breads offered by the “boulangerie,” varying in flavor, length, and thickness. Other popular items include strawberry and apple tarts, as well as cakes and other delicacies. The French are almost as passionate about their “patisserie” (pastries) as they are about their coffee. Fortunately, both of those great French loves go well together and can be indulged anytime the mood strikes.